This blog details the triking adventures of Red and Big Guy, and their inaugural trip to the 2018 Sturgis Rally. yardstick against which all other biker rallies are measured. The question shouldn’t be why we wanted to attend; instead, people should have asked how we could possibly consider going anywhere else. We spent a lot of time talking to our friends, asking questions about riding, and hearing all the details about the memorable trips they had taken. It quickly became obvious Sturgis came up in conversation more than any other place, either as a “bucket-list” destination trip, or as a place they had already visited and wanted to see again. Everyone seemed to have their favorite places to visit. The adjectives we heard over and over were stunning, gorgeous, beautiful, and incredible. Thanks to all that positive feedback, we now have a list of “places to ride” two pages long—how we’re going to do that in thirteen days, I have no idea. So far, we have learned that South Dakota is chockful of beautiful scenery and winding roads, and that there are lots of unique places for us to visit. Big Guy has his eye on the South Dakota Air and Space Museum (once USAF, always USAF) and I’ve been reading up on the history of the Crazy Horse Memorial. We’ve already registered for the Mayor’s Ride—what a cool way to enjoy the scenery and help raise money for Sturgis’s emergency services! Those hard-working folks need all the recognition and help we can give them. (NOTE: if you are interested in riding on the Mayor’s Ride, you may want to register soon. The ride is limited to 150 bikes, and spaces are filling up. 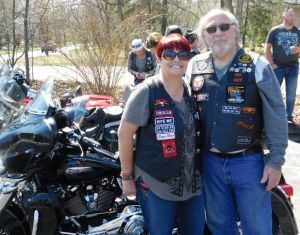 See www.sturgismotorcyclerally.com/annual-mayors- ride for registration info.) Riding and living free—this is our time, and we’re going to enjoy it to the fullest. RIDE ON!